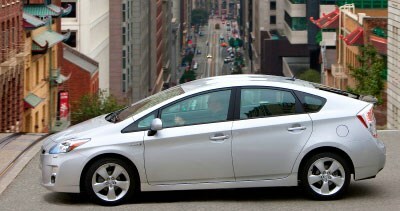 Geeks and greenies will love it unconditionally, but can Prius III also woo drivers? The arrival of the new 3.9L/100km Toyota Prius in some neighbourhoods will be greeted as no more pleasing than the approach of a flaming asteroid. Do not stone these cynics as Earth-haters. Just one look at this blob - yes, blob, because wind tunnels don't sculpt Miuras, they sculpt humpy, lumpy hatchbacks with saggy jowls and thyroid issues - would arouse only a horny baleen whale. And so far, Toyota's tally of scampy, fun-loving hybrids stands at exactly zero. That is, assuming you don't go orgiastic over each microgram per nanolitre of carbon dioxide saved on trips to the shopping centre. For 2009, Toyota proudly unveils a Prius that is only incrementally improved. To make matters worse, Honda has essentially mimeographed the Prius's blob-chic shape with its new Insight. So let the cynics have their field day. Alas, the new Prius is definitely better in some respects. It's less jowly. With its new scything headlights - LED optional - and up-kicked tail, it may even be called daring. Look close for the faint bulge. Saviour it, because that's all the testosterone on offer. Thanks to its more rigid body, wider track and tightly wired steering, the new model is definitely less clueless than its predecessor. Underbonnet kilowatts have risen and acceleration times are quicker. The interior feel has also been coined up, the digital multicolour dash layout with its soaring centre console far less antiseptic than before. People who want to spend Lexus money on a Prius can now do so thanks to a pile-on of posh options. They include a self-parking system, lane-departure alarm, distance-monitoring cruise control, and heaven's own glass sunroof with solar panels which, when the car is parked, power a cabin-cooling fan. A titanium humidor can't be far behind. Indeed, the latest Prius redesign glories in details. The wheelbase remains unchanged, the body has grown longer and wider by mere millimetres. But that body has been reshaped by the dictates of aerodynamics, interior packaging, and bored owners looking for freshness. The nose looks pointier, the upper grille openings smaller. The roof arc peaks farther back to allow more rear-seat headroom. Chiselling in the cheeks and an overhanging spoiler unite with new underbody trays to give a greasy 0.25 drag coefficient, Toyota claims. Below a bank of digital, three-dimensional multicolour displays depicting, among other things, the power flow in the hybrid system, a flying buttress links the dash with the centre armrest while cleaving the front cabin into two distinct compartments. The shift selector moves off the dash and into a more traditional and sportif station at the driver's elbow, where, we are told, so-called 'hyper-milers' can more easily slap it into neutral on coast-downs for the few extra drams of fuel savings. The seats are trimmed more plushly, a height adjuster is now fitted to the driver's seat, and, at long last, the steering wheel tilts and telescopes. About 50kg heavier at 1380kg, the new Prius gets more combined kilowatts underbonnet, 16 from the upsizing of the Atkinson-cycle four-cylinder from 1.5 litres to 1.8, for an even 100kW total. Gone is its predecessor's accessory drive belt: the water pump, steering booster, and air-con compressor are all electric. Conceptually, the 202-volt, 27kW nickel-metal hydride battery pack and hybrid drivetrain are unchanged - one big electric motor helps the engine propel the car while a smaller starter/alternator also controls the drive modes via the planetary gear transmission. Even so, 90 percent of the powertrain components are new, with everything from the water-cooled power inverter to the two drivetrain motors shrunk. The big, 60kW traction motor now has half as much grunt - 207Nm compared with 400Nm - but turns twice as fast, now 13,500rpm, through a torque-multiplying gear reduction drive. The system now more closely resembles that in US-market Camry and Kluger hybrids. Finessing the hybrid drivetrain pays off in the more seamless switchover from electric to petrol propulsion. Apart from installing new engine mounts, engineers replaced the chain-driven final drive with gears so there is less 'chuggling' during engine start-up. Like the Insight, the new Prius lets you select a pure-EV mode, allowing engine-off driving up to 50km/h for 1.6km - remember, the battery pack is small. The Prius also has an 'Eco' mode which slows down the throttle and idles the air-con more often to conserve petrol. Finally, there's a 'Power' mode that prioritises acceleration. Have it your way. Suspension architecture is unchanged - struts up front, a torsion-beam behind. Caster was tweaked to give the helm a more pronounced on-centre feel - before it had basically none - and the electric power steering was retuned for a more natural, less game-console heft. Otherwise, in city driving the new Prius feels pretty much the same as the old car. It still strolls off the line in no great hurry, needing just over 10 seconds to hit 100km/h. Still, this beats the old car, which couldn't reach 100 kays that quickly unless pushed off a cliff. Toyota says it has reworked the soundproofing but we were unable to discern major hush improvements during a petrol-electric tour of central Florida. An android artificiality still characterises the steering and brakes, even if the wheel feels a little firmer to the palms. But the Prius wasn't built for the pilotes in the neighbourhood. It's a commuting corpuscle for people who want to shave their fuel consumption in a highly visible way, rather than shave lap times. And at that, Toyota's wondrous blob excels.